Danny Boyle switches gears completely from Slumdog Millionaire to retell a true story about a young mountaineer. 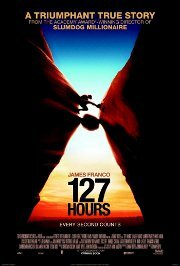 He's out alone in the Utah wilderness, climbing around the canyons, when a momentary mistake leaves him trapped in a remote crevice. He managed to survive for about five days, before making and executing a crucial decision that saw him regain his freedom. This looks like a nice place to rest a while.